Jacquie resides in the beautiful Karangahake Gorge, which holds a rich history and source of endless subjects to capture on canvas. A self-taught artist, she travels widely throughout New Zealand in search of fresh subject material. Aside from private collections throughout New Zealand, Jacquie’s work is represented in many overseas countries, including Japan, England and the United States of America. She is particularly noted for the realistic depictions of nature revealing the effects and moods of light and shade in her landscapes. Her landscapes and seascapes continue to be popular. Pets in Pastel is a very popular addition to her array of talents, as well as her latest abstract works – acrylic pours and resin creations. Jacquie currently works and teaches from her studio and gallery in the Karangahake Gorge, located outside of Paeroa on the Coromandel Peninsula. 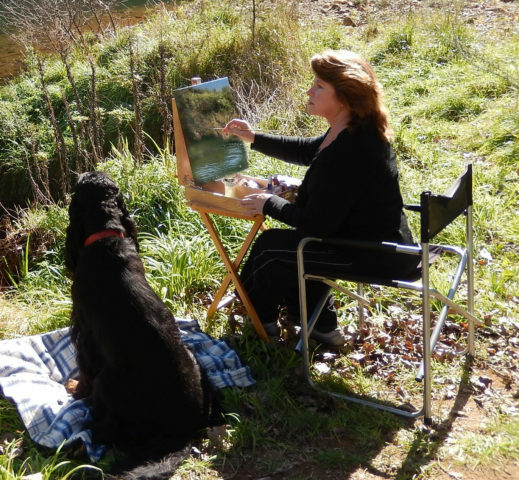 Jacquie welcomes commissioned works of your favourite holiday scene or pet portrait, made just for you. Contact her to discuss. All those who believe in both myself and my work. For my sons – Chris and Daniel, without whose endless patience my art would not be possible. To my beloved Mac – who introduced us to a wonderful place on the Coromandel Peninsula called Otama where we stayed for many long hot summers and walked the beaches in the winter collecting treasures. This area has become the subject of many beautiful paintings. To Sara Yost from Lafayette, Indiana, whose interest in my paintings and friendship I will always value and cherish. To all those who have admired, bought or commissioned paintings. To those who have offered their wall space so that I may exhibit my art to others. To those many students I have the pleasure of teaching and to whom the world of art has been opened. I hope I have inspired you in some way. To all of you – a warm and sincere thanks.